We caught the train from Trivandrum to Kochi (Cochin) on December 31st. We would have liked to stay with our friends for New Year’s Day, but the train only ran once every three days, and we didn’t want to cut it that fine before our flight to The Maldives. Our hotel was still bedecked in Christmas bling when we arrived (they took it down after New Year’s Day). We had one of those glorious Fawlty Towers style interactions with Reception when we arrived, because we had booked a fan room. After quite a long wait, during which they did call the booking website, we were eventually given a key to a fan room. Passive resistance has its place! We located some good local food sources, and had an early night, even though it was New Year’s Eve. The New Year’s Day celebrations tend to be larger than the New Year’s Eve celebrations in this part of India, anyway. 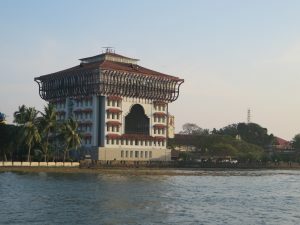 The next day, we set off to explore the Old Town area of Kochi, where there is a British fort. 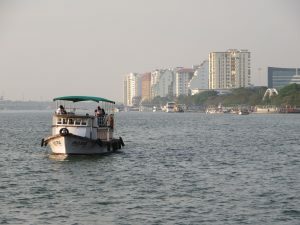 Kochi is boult around a massive inlet and estuary system, so we could ride to the Old Town on a ferry. 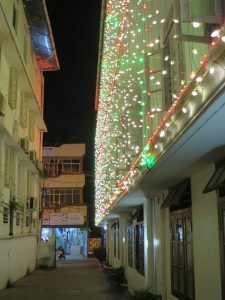 The city has been building high rise, modern buildings, but there are also traditional temples and older shophouses, especially in the Old Town area. Some of the newer buildings have been well-designed, and contain elements from traditional architecture. This striking example faces the harbour, and the ferry route from Ernakulum (where we were staying) to the Old Town (Fort Kochi) passes very close to it. We disembarked from the ferry at the markets. We had taken a “”sightseeing cruise”, which has disappointingly just gone across the bay in a straight line pretty much the same as the regular ferry (but costing 150 rupees instead of four rupees). The only upside was that the “sightseeing cruise” docked in the centre of activity, whereas the government ferry wharf was a 20-minute walk off to one side. We resolved to do the walk and save the money on the return journey. Along the waterfront by the markets were a row of huge fishing nets. They are not actually working fishing nets; they are sculptures commemorating the Chinese fishermen who lived and worked in the area in the 19th century. As we were looking at the fishing nets, we noticed some disturbances on the water. 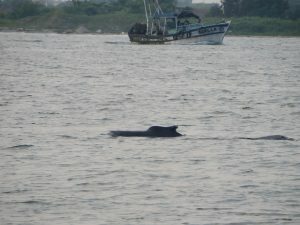 There was a pod of dolphins in the harbour! After watching for quite some time, and capturing a few photos, we decided that these were actually narwhals, rather than dolphins. We saw at least one pointy horn on a head, and there was a suspicious hump on the shoulders. 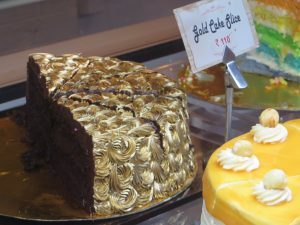 We wandered along the paved footpath, which followed the beachfront, and sampling various delights (or not, depending on the observed level of food hygiene being practiced). 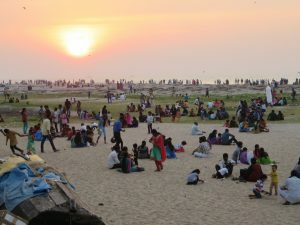 We had developed a regular practice of watching the sun go down into the sea in Trivandrum, so we were planning to sit somewhere on the beach and do likewise here. Unfortunately, we were not the only ones to have this idea! There is something in the Indian national character when it comes to taking photos. We had become accustomed to people stopping us and asking to take a photo with us – this even happened when we encountered Indian nationals elsewhere, such as in Nepal. This family, though, wanted a photo taken on our camera. Why? We will never know, but we obliged. 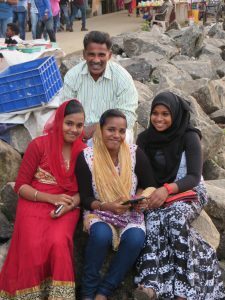 Kochi is in Christian Kerala, but these women appeared to be wearing hijabs. Perhaps they were tourists. Apart from the headwear, Indian women of all religions cover up to this extent. Hindu women expose their waists (and sometimes their elbows, too) when they wear saris, but legs of all religions are always fully covered in public (we did see Indian women wearing shorts in yoga classes in Pune). After sunset, we made our way back into the Old Town, taking a quick look at the Dutch Cemetery, apparently a big tourist drawcard. We were a little disturbed when we saw this sign. 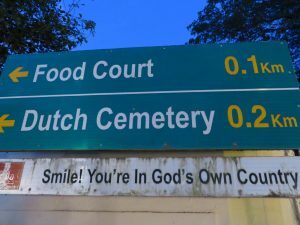 That’s a little close for comfort, having a food court 100m from a cemetery, and the “Smile! You’re in God’s Own Country”, which is everywhere in Kerala, takes on a vaguely sinister tone in this context. Our attempts to make our way back to the ferry terminal were frustrated by a large number of road closures for a parade. 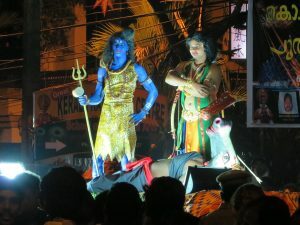 Despite the solidly Christian environment, the parade was almost entirely Hindu imagery. In the end, after waiting patiently for the parade to pass for quite some time, we ducked across the road between floats, and continued our hunt for an auto-rickshaw. Eventually, we found one, but the traffic was so thick around the wharves that we ended up getting out and walking. The best way to travel turned out to be following immediately behind a motorcycle. From time to time, the motorcycle would get trapped, and then we could duck out from behind it, weave through the gridlocked traffic, and locate another motorcycle that was moving. There were also times when it was possible to walk on the footpath, but the footpath was not continuous, and often filled up with gridlocked motorbikes, so walking on the road was easier. We benefited from the Indian practice of having separate queues for men and women – Jenny could stroll up to the ticket counter and be fourth in line, while Ravi was stuck in a 20m long queue of men. Jenny bought our tickets, and two tickets for the two chaps we had been chatting with before we realised this lurk existed, and we hopped on the next ferry. Four rupees each (about 10c) for a ferry ride of a similar length to Sydney’s Manly Ferry ($7.50 per person). 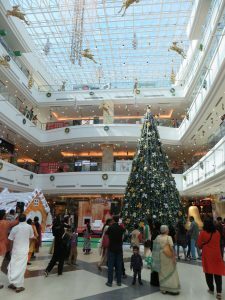 The next day, we sought out THE big Westernised shopping centre, as Ravi needed to buy new cargo shorts. It still had its Christmas decorations up, and the open spaces, high ceilings, and overall cleanliness were very comforting. Even the well-dressed middle-aged matrons here, though, would body-block you as soon as look at you is you didn’t move as fast as they thought you should to shoulder-charge between the people emerging from the lift. It was here that we got our best opportunity to photograph the traditional Southern Indian “nappy” (as we called it until we learned the correct word – dhoti), which was worn by many men, often in conjunction with a neatly-pressed busi ness shirt. Mostly older men, though – the men under 30 seemed to favour pants. 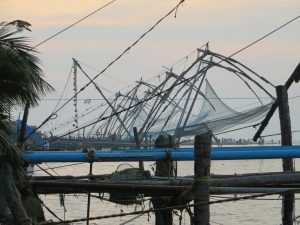 We only had a couple of days in Kochi, because we were flying out to the Maldives. 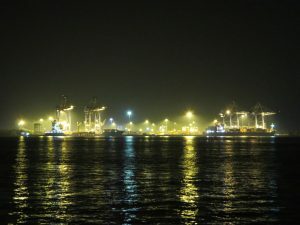 We had a longer time there than we intended, because the trains ran only once every three days, but we were glad to have taken the time, because the harbour and Fort Kochi were very beautiful. Maybe next time, we will take one of the tourist cruises up the estuarine river to a traditional village for a traditional lunch. Having seen the narwhals, though, we didn’t feel we had been deprived of natural wonder. 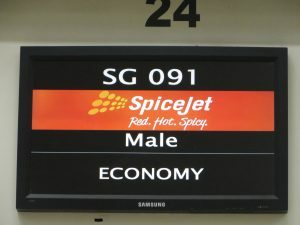 We were well accustomed to being separated into men’s and women’s queues for security screening at Indian airports (and Nepali ones), and we were fresh from having discovered the women’s queue to buy ferry tickets, so we were not the least bit surprised to find gendered check-in lanes at the airport. There were three male check-in counters, but we couldn’t see the female ones anywhere.